Congrats to Klicka Lab undergrads Sara Wang and Ross Furbush on their excellent poster presentations at UW’s annual Undergrad Research Symposium! Members of the Klicka Lab attended a ddRADseq training workshop hosted by the Leache Lab here at UW. Next-generation sequencing (NGS) platforms enable low-cost sequencing of whole or partial genomes in a relatively short time. Double-digest restriction-site associated DNA sequencing (ddRADseq) is an exciting new NGS method for population genomics, and ddRADseq will provide lab members with an attractive alternative to sequence capture methods currently used in the lab. Special thanks to Jared Grummer and the Leache Lab for all of their hard work and patience! Front row, left to right: Andreas Chavez, Itzue Caviedes-Solis, Rob Bryson, Rubi Meza, Dustin Wood, Jared Grummer. Back row, left to right: Andy Gottscho, Jon Richmond, Matt McElroy, Kevin Epperly, Adam Leaché, Leonard Jones. Two new graduate students recently joined the Klicka Lab. 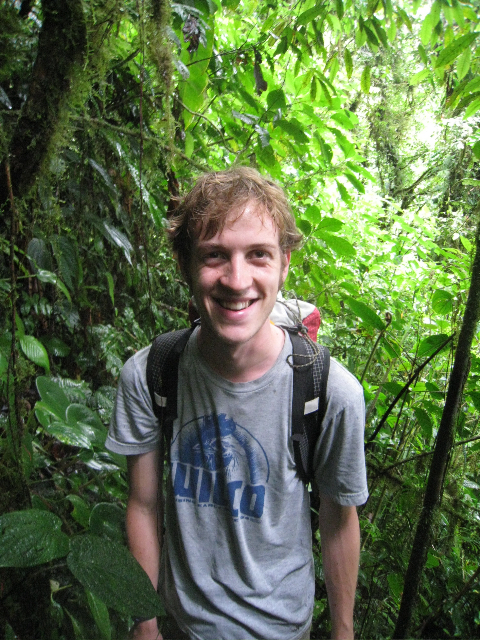 CJ Battey graduated from UC Berkeley in 2010 with a double major in Integrative Biology and English, and is broadly interested in avian evolution and phylogeography. Outside of the lab CJ enjoys slack-key guitar and South American politics. 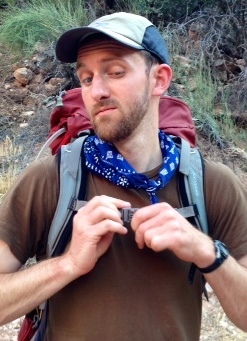 Dave Slager obtained his MS in Wildlife Ecology from Ohio State University in 2011, and is broadly interested in evolution and systematics, especially avian phylogenetics, phylogeography, niche evolution, speciation, and biogeography. Dave is is a seasoned field ornithologist, and in his spare time enjoys birding and studying avian field identification, species distributions, and natural history. Welcome aboard!! Birds, and snakes, and lizards! Oh, my! ≈ Comments Off on Birds, and snakes, and lizards! Oh, my! Photo caption: Rob Bryson (left) herping while John Klicka (right) dubiously watches and enjoys a snack. Photo by Alejandro Huereca (affectionately dubbed Treebeard on this trip). We were awarded a new grant from NSF for our collaborative project with John McCormack to study the comparative phylogeography of Mexican pine-oak birds and herps using phylogenomic data. An abstract and more details on our award can be found here. Welcome new Klicka Lab members! ≈ Comments Off on Welcome new Klicka Lab members! Welcome new Klicka Lab members! These volunteers will be learning molecular lab techniques centered around Sanger and next-gen sequencing. All three are also working in the Burke Museum’s Ornithology Collections. Sara Wang. Sara is a senior here at the UW pursuing a double degree in Biology and Environmental Science and Resource Management. She is broadly interested in avian phylogeny and behavior and wildlife rehabilitation. Michael Chung. Michael is a 2012 graduate of Michigan State University, where he majored in Zoology. His research interests are in ecology, evolution, and animal behavior. Kevin Epperly. Kevin graduated from the UW in 2007, with a major in Anthropology. He has worked in the ornithology collection at the Burke Museum for seven years. Kevin’s research interests include phylogenetics, phylogeography, behavioral ecology, population mechanics, and emergent systems. Our recent paper published in Ecology Letters was recommended by the Faculty of 1000 as an important paper in ecology. In our study, we compared latitudinal range patterns between families of New World vertebrates that had ancestral geographic origins in North and South America. We found that families that originated in South America exhibited strong niche conservatism and were largely restricted to the Neotropical region. In contrast, families that originated in North America were more widely distributed across the Nearctic and Neotropical regions. We suggest that this asymmetry in niche conservatism has influenced biodiversity patterns in the New World, and is one of the underlying causes of the latitudinal biodiversity gradient. Smith BT, Bryson RW, Houston D, Klicka J. 2012. An asymmetry in niche conservatism contributes to the latitudinal species diversity gradient in New World vertebrates. Ecology Letters 15: 1318-1325.